Viviscal products are scientifically formulated to support healthy hair growth by nourishing the hair and the scalp from the inside out. For over 20 years, the company has been researching hair loss and has developed an effective dietary supplement to encourage growth. Viviscal Hair Growth and Hair Care Programs for men and women stimulate the scalp and add volume to thin, fine strands with drug-free formulas and special care regimens. Viviscal understands the effects that hormones, nutrition, heredity, medications, and everyday stress can have on the hair. Even harsh cleansing products and over-styling can wreak havoc on hair and scalp. 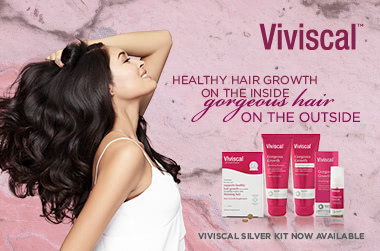 To help women's hair look vibrant and healthy, Viviscal has developed a dual-action treatment plan that promotes healthy hair growth from the inside, which leads to beautiful hair on the outside. The Dual-Action Viviscal Hair Care System begins with 100% drug-free Viviscal Extra Strength Dietary Supplements. Next, care for the hair and scalp with Viviscal Gorgeous Growth Densifying Shampoo and Conditioner. The shampoo contains the proprietary Ana:Tel complex plus keratin, biotin, and zinc to nourish the hair. A fragrant botanical blend leaves hair with a fresh, clean scent. Follow cleansing with weightless Densifying Conditioner, which also contains Ana:Tel plus keratin, biotin, and zinc. Next, apply Viviscal Gorgeous Growth Densifying Elixir, a lightweight leave-in treatment that makes hair look thicker and fuller. Add the last touch of volume to your hair with Viviscal Hair Filler Fibers. These microscopic, electrostatically charged fibres adhere to your hair to fill in sparse areas. Viviscal Hair Filler Fibers are available in six natural-looking colours, ranging from deepest black to blonde, and can be blended to achieve your perfect shade. The product will not stain or smear, washes out easily, and is suitable for all hair types. I wash my hair 1-2x per week. I use this after towel drying my hair. It leave my hair more volumised without and frizz free without any drying! I feel that my hair growth phase has been longer :) I will be repurchasing as a little goes a long way!